Since 1996 Hiltron has been manufacturing control units for SatCom equipment and for industrial control&monitoring applications. 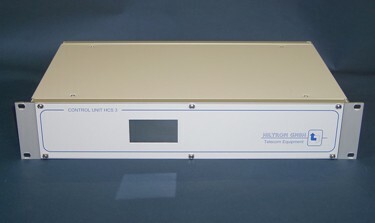 Our main product is the Controller HCS3 with its unique features. This design has been re-developped with improved features functionality to the new Hiltron controller systemComSysCore. The HCS3 is a highly modular controller for monitoring, control and supply for fiber optic modules, fiber optic N:1 switchover systems, LNB redundancy systems, HPA redundancy systems, redundancy systems for DVB MPEG encoders/modulators/IRDs and other applications. The card modules are programmable to provide the functionality for the various controller versions. Presently, the following versions are available. Monitoring, control and power supply for fiber optic modules. Moreover the modules are capable of supplying DC power to fiberoptic modules, waveguide and coaxial switches, LNBs, etc. Universal Ultra Flexible Controller for Fiberoptic Modules of FOXCOM SAT-LIGHTTM Series Satellite Earth Station Equipment. 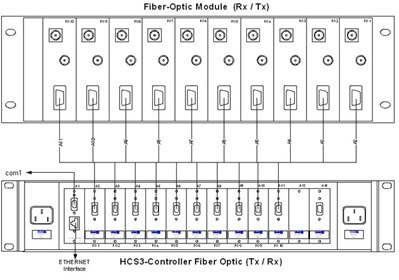 The HCS3 is a highly modular controller for fiberoptic modules of the FOXCOM SAT-LIGHT Series. Due to its high flexibility it is also used as a controller for N:1 redundancy switching of satellite earth station equipment. The 11 interface connection slots can be equipped with different hot-pluggable functional card modules. For driving the FO Tx/Rx modules the modules type HCS.IOx are required and used. The control function can be enhanced by using switch card modules for redundancy configuration. 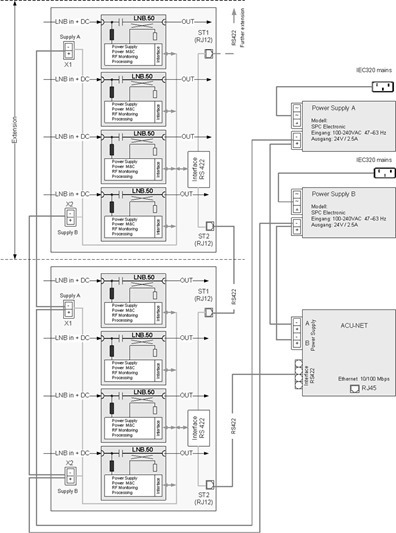 The figure show the interface HCS3 FO Controller and the Chassis with the FO Tx/Rx modules. Each HCS3.IO – module is connected to its FO Tx/Rx module by a cable with 9P Sub-D connectors. The HCS3.IOx - module supplies, controls and monitors the FO Tx/Rx module. The Hiltron LNB Power Supply System is a modular redundant system for the supply, protection, monitoring and control of LNBs. 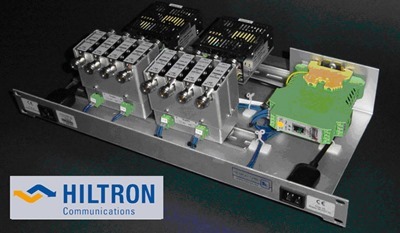 The Hiltron LNB Power Supply System is modular supply system for SATCOM applications. It protects the LNB and allows to control and monitor the supply parameters as well the input signal level. The system is expandable and consists of one or more supply blocks comprising each four LNB supply modules. The number of blocks is limited by the max. available power of the selected main power supplies. A single module type LNB.50 contains a power control circuitry for setting and monitoring; the supply voltage and the max. tolerable current. Furthermore it contains a RF level detector to monitor the total LNB output RF output level. Each block has a redundant power supply interface A and B and two communication bus interfaces type RS422 which allows to cas-cade several blocks easily.